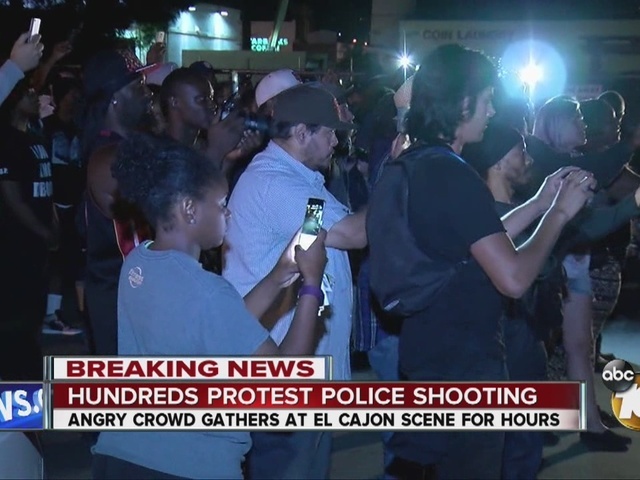 SAN DIEGO -- Authorities chose not to clear the hundreds of protesters who gathered at the scene of the fatal police shooting of a black man in El Cajon Tuesday night. This as authorities gear up for more protests Wednesday. At about 8 p.m. Tuesday, a handful of officers in riot gear, some with barking police dogs formed a line, appearing ready to disperse the crowd at a strip mall parking lot in the 800 block of Broadway. But the officers were vastly outnumbered by the large and vocal crowd, which included people of all races and ages. The officers stood in a line for about 10 minutes. Then, they retreated to their cars which were parked in the alley. As officers drove off, a few protesters spat on patrol cars and yelled obscenities at them. “There’s people all over the United States that are hurting right now,” one pastor said while leading a prayer circle. After police left, the protesters dispersed on their own. Another protest is set to take place Wednesday at 9 a.m. at the El Cajon Police headquarters at 100 Civic Center Way. Speakers from local churches and the NAACP will be in attendance. Mallory Webb, the president of the NAACP Youth Council, issued the following statement to 10News. "These police officer shootings are modern day lynchings. But instead of blacks hanging in the middle of the town square or on trees alongside the main road, we are witnessing killings repeatedly on social media and TV." pocket, said El Cajon police Capt. Frank LaHaye. "Because the subject did not comply, the officer drew his firearm and pointed it at the subject while continuing to give him instructions to remove his hand from his pocket," LaHaye said in a statement. The officers attempted to talk to the man while he paced back and forth, but he then "rapidly drew an object from his front pants pocket, placed both hands together and extended them rapidly toward the officer taking up what appeared to be a shooting stance," according to the lieutenant. One officer fired his service weapon at the man several times and a second officer deployed a Taser. Bystanders reported hearing about five shots. The officers, each with more than 20 years of service, will be placed on administrative leave for at least three days, as per protocol, El Cajon Police Chief Jeff Davis told reporters at a news conference Tuesday night. He promised a thorough and transparent multi-agency investigation.